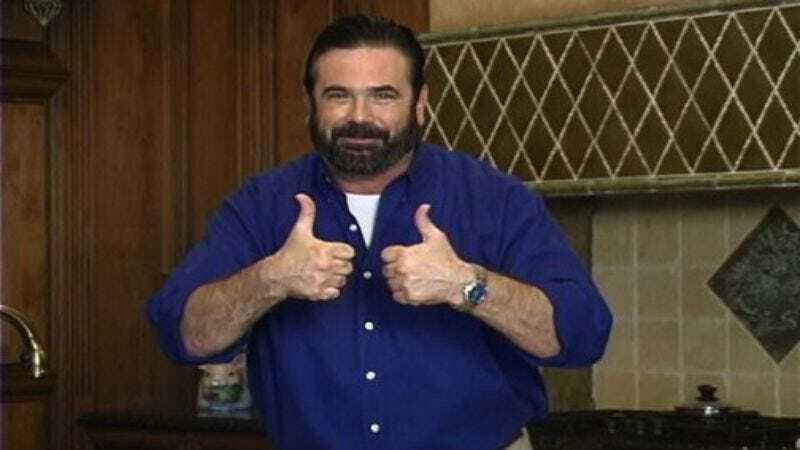 A full week of celebrity deaths reaches a bizarre end with the death of Billy Mays, a television personality who became a familiar face as the commercial spokesman for the Orange Glo family of cleaners (OxiClean and the like), and then took on shilling duties for a variety of other products. Mays was one of those TV regulars who eventually became "famous for being famous," appearing in late night sketches and meta-commercials that riffed on his tendency to shout his lines rapidly while hunched-over. Mays even had his own reality series, Pitchmen, which went behind-the-scenes at the filming of his ads and showed how he and his business partner Anthony Sullivan selected the products they pushed. While returning to his Tampa home on Saturday from a Pitchmen promotional tour—which included a visit to The Tonight Show With Conan O'Brien—Mays' US Airways flight blew out its tires, and in an interview with local TV, Mays said that some objects from the overhead compartments "hit me on the head, but I got a hard head." According to Mays' wife, he went to bed feeling unwell, and in the morning was unresponsive. He was pronounced dead at 7:45 a.m. At present, no cause of death has been determined.